Hong Kong is a destination where you will find something to do year around, but what is the best time to visit Hong Kong? There really isn’t a tourist season or so to speak, but you will be wise to avoid certain major holiday or extremely hot weather if you can. From when to avoid, when the weather is best or what festivals you might want to visit, I will reveal all! Visiting for the first time? I got a Hong Kong Guide for you! Hong Kong is a subtropical country and the weather tends to be on the hot and humid side. The weather tends to stay warm from March to November, with June to September being the typhoon season and prone to stormy weather and extreme heat. The weather cools down in December and it won’t usually falls below 0-degree celsius and hover around t10 degree celsius. In short, the best time to visit Hong Kong, weatherwise: October to December, March to May to avoid extreme heat or cold. If you happen to be there during undesirable weather – why not head to a cute dog cafe and spend time with some huskies? As a former British Colony, Hong Kong not only have Chinese but also Western Holidays. The biggest are Christmas and Chinese New Year, with numerous small holidays scattered in between. It is crowded year around, however, avoiding the Public Holidays in China would do you a world of good as the crowd can double. The tomb sweeping day festival where Chinese visits the graves of their deceased family members. Nowadays, this holiday is often utilized as an actual holiday and the tomb sweeping will be done around the same period but not necessarily on the exact day. The labour day holiday is one of the biggest for workers in China and usually result in a huge influx of tourists from China to Hong Kong. Hence, it’s best to avoid this holiday. A public holiday draws crowd flooding in! Another major holiday, the celebration you can see doesn’t outweigh the monster size crowd. This is the second “Tomb Sweeping Day” of the year, but it also encourages hiking. If you want to see where you can hike in Hong Kong, I’ve got a whole page dedicated to hiking. However, you don’t want to hike with a crowd! Chinese New Year = red and gold time! Lunar New Year is also called Chinese New Year in China. It is a family holiday but in the metropolis of Hong Kong, plenty of places remains open and the decorations would be on. There is a parade on the first day of the Lunar New Year with both traditional Chinese elements such as the lion dance as well as western performance such as marching band. This takes place on Hong Kong Island and you can pre book tickets for a seat or head there early and find a good spot along the way. Another visit you can make is to the “Nian Xiao” Market. Directly translated as New Year’s Eve Market, this is where people get all they need for the New Year such as food, decorations etc. The one at Victoria Park is the biggest around and deserve a roam. A festival that originated from the masses trying to save the body of Qu Yuan, a politician and poet in ancient China who had drowned himself after his country fell apart, in around 284 BC. Now, it’s a major festival that centers around the Dragon Boat race and in Hong Kong, this is a huge sports event with many fishermen, sports center and companies sending teams to compete. Another tradition is the eating of Rice Dumplings, in pyramid-shape and wrapped in leaves, which was thrown into the river by the masses to save the fishes from eating Qu Yuen’s body. Characterise by the rounded lanterns and mooncakes, the Mid Autumn Festival in autumn is a wonderful sight to behold. In Causeway Bay in particular, you will see the fire lion dance and the Victoria Park will host the Lantern Festival with stalls and performances. A Song Dynasty General who has become the god to go to for good luck. He visited Hong Kong with the King back in the days and the building of his temple is said to have saved Shatin from plague. He became popular to gamblers with many who visit the Shatin Racecourse dropping by to pray for good fortune. Hence, on his birthday fortune wheels and drum beat are prominent in the temple. Tin Hau is the sea goddess of Hong Kong and is extremely popular with the fishermen. There are no less than 70 Tin Hau Temples scattered throughout Hong Kong. However, during the Birthday of Tin Hau, the temple at Yuen Long has the grandest celebration. With parade, floral wreaths and lion dance, it’s a festivity like no others. A huge traditional festival on Cheung Chau with lion dance, “Bao Mountain” and is a huge tourist attraction. There are two theories to its origins: 1) some of the villages pretend to be gods on a parade to rid the town of plague a couple hundred years ago. 2) it’s the annual religious affair. The festivities last for a week and ends with the “Bao Mountain fight”, which was banned after the incident in 1978 but reopened in 2005. 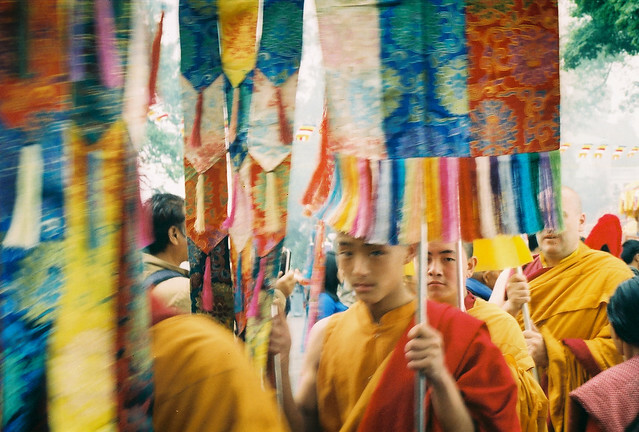 Every year on the Buddha’s Birthday, celebrations are carried out in the Buddhist Temples around Hong Kong. The grandest of them all is at Po Lin temple in Lantau Island. Aside from the usual incense burning and offerings, a statue of the Buddha is also bathed, corresponding to the legend of the Budhha being bathed by 9 dragons at birth. For those of you who are unfamiliar with the Monkey God, he is a Chinese mythology figure that was born out of a rock and the king of Mountain of Flowers and Fruits. He has supernatural power and was untamable, leading to the Buddha binding him under the Five Finger Mountain. He was given a chance to redeem himself on the Jounrey to the West, to India, accompanying a monk to get the Buddhist scriptures. The Monkey King Temple is in the Po Tat Estate, in Sau Mau Ping, Kowloon, where you can see offering and rituals of the festivities. Aside from festivals and major holidays, there are other events going on in this metropolis that might tickle your fancy. There are big, annual events every year and below are some of my favourite (and ones that I am aware of. Hence, this list would be added to whenever something pops up on my radar! If you want to try some fine dining for less, then don’t miss restaurant week in Hong Kong. Usually take place in at the end of February, it involves a ton of restaurants offering set menus for both lunch and dinner at a set price (anything from 199 to 399HKD) of several courses. I was away in 2016 but this year, I got to try one of them. Remember that individual restaurant quality varies. If you live in London or Dubai, then you’ll be no stranger to the Taste. 2017 is its third year running and for those who don’t know what it is, it’s basically a food festival involving the best restaurants in Hong Kong. The entrance fee starts around 100 HKD (pssst – Sassy HK offers 27% off) and yes, you need to pay on top for food inside. However, with top names like Duddells, Zuma, Rhoda and Cafe Grey Deluxe, the fact that you can grab something from them starting at 50HKD is a steal! Over 300kg of Waygu beef was consumed there in 2016 and it’s only a 4-day event! Fancy that! Hong Kong might be no Brussels with their extravagant flower shows, but we do have our own version. Though I haven’t been since I was a kid, many horticulture fans (like my mother) flock there every year. Also happening in March, it takes place in Victoria Park and feature a particular flower each year with many exhibitions inside. Tickets are dirt cheap at 14 HKD (which is like 2 USD), so if you are in the area at the right time, no reason to not go inside and seek out some photo opportunity. Oh my gosh I LOVE mid-autumn festival time in Hong Kong! The moon is so beautiful and “bo lap” is so fun haha. Great post Nam! Amazing post guys! so detailed! can’t wait to get over to this side of world.Also, love that Hong Kong geographic map! !